Babywearing Made My Life Easier + a Beco Carrier Giveaway! Mama Say What?! | Mama Say What?! Babywearing Made My Life Easier + a Beco Carrier Giveaway! **Scroll to the bottom for the winner. ** Babywearing Made My Life Easier + a Beco Carrier Giveaway! I wasn’t very knowledgeable about the benefits of babywearing when I was pregnant. My mama raved about the baby carrier she had in the early 1980s and a close friend of mine recommended her Moby Wrap when she had her son in 2006. I loved seeing how snugly she was with her little boy in the Moby Wrap, so I added one to my baby registry. I was blessed with a newborn who wouldn’t sleep anywhere but right on his mama, so I started babywearing pretty early on… if anything, to save my sanity. When he was a little guy, I wore him for naps, every time we went to the store, for a walk, or whenever I needed to get out of the house. Because TJ was born in early October, wearing him whenever we went out once the temperature dropped made the most sense. Having him right up against his mama kept both of us warm. Around Christmas, I loved the smiles we got as we walked through the local mall with him wrapped up tight. More importantly, I felt so connected to my son. I knew when he was hungry before he ever let out a cry of hunger, I knew when he sleepy and he was comforted by the sounds of my voice and my heartbeat. He slept better, cried less, became so observant to everything going on around him. This article discusses just some of the wonderful benefits of babywearing including how it reduces infant stress and encourages proper spine development. When TJ started outgrowing the Moby at around four months old, I looked around for a baby carrier that would last me for awhile. I narrowed it down to the Ergo Baby Carrier and the Beco Butterfly 2 Baby Carrier (discontinued in 2013). Reviews for their awesomeness were pretty equal, and the price points were similar. I wasn’t looking for a pretty pattern either, even though both companies have quite a few gorgeous patterns. I wanted a simple black carrier as I wanted my husband to be comfortable using it too. In the end, the Beco won out because of its construction; I could move my baby from my front to my back or vice versa without taking him out of the carrier. I could also take the carrier off and transfer it to my husband or someone else without taking my son out of the carrier. The fact that an infant insert was included with my purchase was a plus, but by the time I bought it, my son had outgrown the infant insert. Once I was able to get the straps adjusted to fit my 5’9″, long-torsoed self, it was wonderful. Our Beco comes with us almost everywhere. 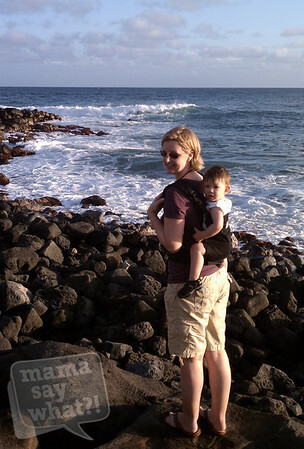 Where babywearing has been the most convenient is when we travel. We fly a lot; often one to two times a month to visit our family in northern California. Wearing my son when navigating airports has made flying with him SO incredibly easy, especially when it’s just the two of us flying. I get through airport security with him safely on my back, quickly and with ease. And it always makes me smile when a seasoned flier or a businessman sees that I have a child and switches to another line… and then we get through security faster than them. I talk a little bit about babywearing in an airport in my post about Flying with Babies and Toddlers. Don’t get me wrong, I love my strollers too. I have a MacLaren Triumph umbrella stroller and an EasyWalker Sky all-terrain stroller. I love them both for different reasons and find myself using them more and more now that my son is older and well over 30 pounds. This month I had to go to the DMV with TJ and he was wonderfully behaved, strapped in his stroller. But we still bring our Beco carrier every time we fly, just in case we need it. This past Spring, we spent Mother’s Day weekend exploring New York City. Rather than bother with a stroller, we just wore TJ most of the time. We walked a ton during that trip (over five miles on the first day! ), my husband and I taking turns wearing our son as TJ got to explore the city with us, up on our level. Leaving the stroller at home gave us a wonderful sense of freedom. Yes, we were both sore at the end of each day, but it was worth it and we had a blast. Just last month we spent two weeks in Hong Kong, Macau and the island of Hainan, and the Beco came along with us. 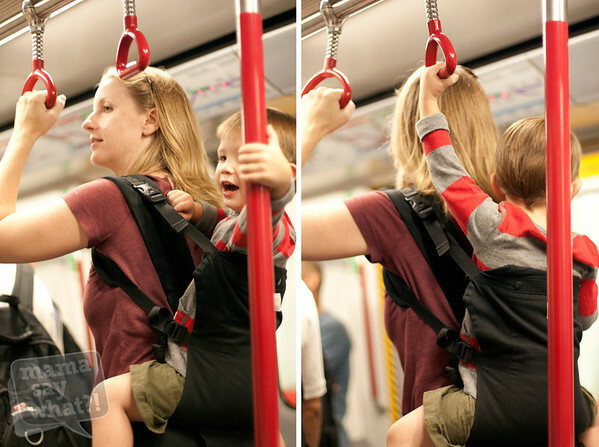 In a city as densely populated as Hong Kong, the baby carrier was really the only way my husband and I were comfortable exploring with our son, who turned three just days before the trip and loves to run around… often with little regard for his own safety. Hong Kong’s public transportation system is pretty easy to navigate, but we felt so much more at ease traversing the city with TJ safely strapped to either my back or my husband’s back. We visited many places where there just wouldn’t have been space for a stroller. We are both aware that our days of babywearing are drawing to a close as TJ gets older and heavier. It makes me a little sad, especially since we have been struggling to conceive baby number two, when I KNOW babywearing will come in handy. But I know we will have more days of babywearing in the future and I will get to snuggle a newborn in my wrap carrier again someday. We have explored Seattle, San Francisco, New York City, Las Vegas, Los Angeles, Kansas City, Hong Kong, Kauai and countless airports with our son in his Beco carrier. It’s been an amazing babywearing journey and I can’t wait to do it with another. 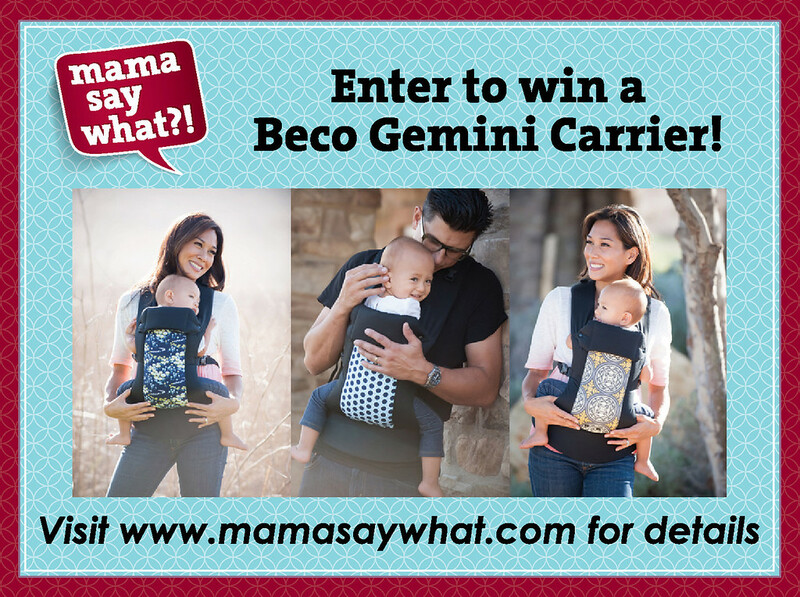 In celebration of babywearing and my love for my Beco Carrier, Beco has graciously contributed a Beco Gemini Baby Carrier for us to give to one lucky reader! The winner will get to choose from the patterns they currently have available: Austin, Dale, Genesis, Jared, Serenity, or Sunset. Check out Beco’s website to see how gorgeous these patterns are and to see all of the features of the Beco Gemini. It can be worn in a front, back or hip carry! There are many ways to enter to become the one lucky winner. Please make sure to follow the rules carefully. You MUST complete all of the mandatory entries for your entries to count. We will be verifying your entries if you are the winner. Please see the Terms & Conditions of the Rafflecopter app for more information. Best of luck to everyone and happy babywearing! Thank you to all who have participated! This was an amazing giveaway. Congratulations to Laura N! Please contact us at info@mamasaywhat.com to claim your prize. Ring Sling Review and Giveaway! Líllébaby Carrier and a Giveaway! Baby K’tan Review and Giveaway! Added by Alex T. on December 11, 2012. 69 Responses to Babywearing Made My Life Easier + a Beco Carrier Giveaway! I have an ergo right now but I’ve heard such great things about the beco I put it on my Christmas list this year my 5 month old LOVES to be in the ergo! this is my favorite article so far. Babywearing changed my life too. so excited about this giveaway! I’ve always looked up to Alex as the babywearing guru! I really hope to get more into babywearing when baby #2 arrives, this just might be the carrier I choose! This is my favorite article! Baby wearing is amazing and has so many benefits that most people (non baby wearers!) don’t even realize! So glad there are people trying to get the word out. This is my favorite article at this time! I have been really trying to decide weather we should get a Beco or Ergo, and this article has really helped me narrow my decision! Loved this article on baby wearing! We currently have 2 kiddos & only 1 carrier (the Ergo)…I would love to try out the Beco as well, I’ve heard great things about it so many places! First time to your site, but I love stories about babywearing! So this one is great! I will be sure to check back for more. Love all the babywearing pictures. I love babywearing! This is my first time on this blog, but it is very well written. I love reading about the practical reasons for babywearing. We also love our Moby Wrap and prefer our Beco Butterfly to the Ergo. Would LOVE to win a Gemini! I want a Beco so bad! I’ve got an Ergo that I love, and so does Hubble, but I’m always looking for new things to help me make life with my 5 1/2 month old easier…and I bet a Beco would really help! So glad I found this site! I <3 babywearing! I have a Moby, a guaze wrap, a mei tai, and a BobaAIR. The only thing missing is a Beco! I’d have to say that THIS is my favorite post! I loved ‘Real Birth: Annabelle’s Arrival’. I love reading birth stories! THIS is my favorite post! I LOVE LOVE LOVE babywearing. I don’t know how I’d survive having 4 kids 4 and under adn being pregnant without babywearing. We got a Boba when my daughter was 10 months and I really loved it for back carrying. I’d love a beco though because #2 is on the way, and I can’t use my boba for infant. I’m sure I will be wearing this baby A LOT while I’m chasing #1 around. With 5 children ages 5, 5, 3, 1, 5 months, carrying my baby is a must! Honestly, I like this post the best because it’s encouraging me to wear my baby more often. My kids get very antsy once they get mobile, so I give up on wearing them. I’ll persevere with baby #4! I loved wearing both my kids and can’t wait to do the same with my third. Not only is a great way to bond and snuggle, but so much more convenient when you have a toddler to keep up with also! I love wearing my little guy and I love my beco! I have a brown one so my husband is comfortable wearing it, but I would Love to have one of their beautiful designs! Beco is my wishlist for this year.. I love baby wearing and beco! This is also my first time here, and I do love this post my babe is the same, she loves to be held at all times and I love to hold her but need something to hold her in. This is my first time as well. Wish everyone, including myself luck! Sorry if it seems cheap, but in all honesty this article is my fave. I love babywearing for mostly the same reasons as you. With a toddler and an infant to care for at once, I feel like my infant would really be missing out if I needed my hands to carry her. And it almost never fails to lull her to sleep. Win! Definitely this is my favorite post. Giveaways rock! My favorite post. I can relate to baby wearing, especially the travel. Makes it so much easier! This babywearing made my life easier article was my favorite as it is on point what I was looking for! I have been comparing the Beco vs. Ergo for a while and you answered a bunch of my concerns and questions!! Thank you!! Great article. We love our Beco and how easy it is. I love holding my babies so close and it makes me so proud that my husband will wear our little girl without a blink of an eye. I recommend Beco to all of my friends who swear by the Ergo or other carriers. Our little girl is 19 months old and still loves to be worn and we still love to wear her. We can’t wait for her little brother or sister to get here so we can begin the baby wearing again! I love that post!! I’m all about baby wearing!! I just ordered a Beco Butterfly II and I can’t wait to try it on… Though I would love the Gemini!! Hello… this is my fav article. I have tried moby wrap too and Boba for baby #1, and I loved both. But when baby N was getting heavier, Boba didn’t work anymore I’ve got backache. Then I tried my friend’s Beco, and well I thought I should have Beco. So here I am, hoping to win Beco for baby #1 and baby #2 due May 2013. I love the birth stories, its hard to pick just one! Would love to win this! Just got a Boba and would love a Beco too! Question, are we supposed to be tagging Beco Baby Carrier UK on the Facebook share? That’s what comes up with @becobaby. @becobabycarrier is the US one. Just wanted to clarify. I hope people don’t get disqualified for tagging the wrong one since that is a little confusing. I enjoyed your review of Exema Creams…very informative…my grandbabies all have exema! This article was my favorite! The more I read about baby wearing, the more excited I am to try it out! Thank you for sharing your story! Especially regarding travel, which my husband and I love to do. It seems way more convenient without a stroller! Thanks so much to everyone who entered the giveaway and commented on their love of babywearing. Pingback: Real Review: Timbuk2 Swig Backpack | Mama Say What?! Pingback: Traveling: Asian Vacation with Our 3-Year-Old Mama Say What?! | Mama Say What?! I love that this article includes pictures of an older toddler still in a carrier. I have read about the extended time they can be used, but have never actually seen one in action! Thanks! Pingback: DIY Mini Mei Tai Doll Carrier Mama Say What?! | Mama Say What?! Pingback: Flying with Babies & Toddlers - Pre-Flight Mama Say What?! | Mama Say What?! We are about to take our little one on her first trip! She will be three months and I am a little aprehensive but we are ditching the stroller and only babywearing. Thank you for this post! Pingback: Líllébaby Organic Baby Carrier Review & Giveaway Mama Say What?! | Mama Say What?! Pingback: Baby Carrier Comparison: Ergo, Beco & Líllébaby Mama Say What?! | Mama Say What?! Pingback: Flying Alone With Your Kids: My Ten Survival Tips Mama Say What?! | Mama Say What?! Pingback: My Journey to Fitness: Hike It Baby Mama Say What?! | Mama Say What?! Pingback: Líllébaby Essentials Baby Carrier Mama Say What?! | Mama Say What?! Pingback: Comparing Toddler Carriers - Beco, Kinderpack, Tula, & Líllébaby Mama Say What?! | Mama Say What? !